FREE and open to UWM students only; Lunch provided! In honor of Cesar Chavez Day, let’s get off campus for an afternoon of exploring activism within Milwaukee’s Latinx community. 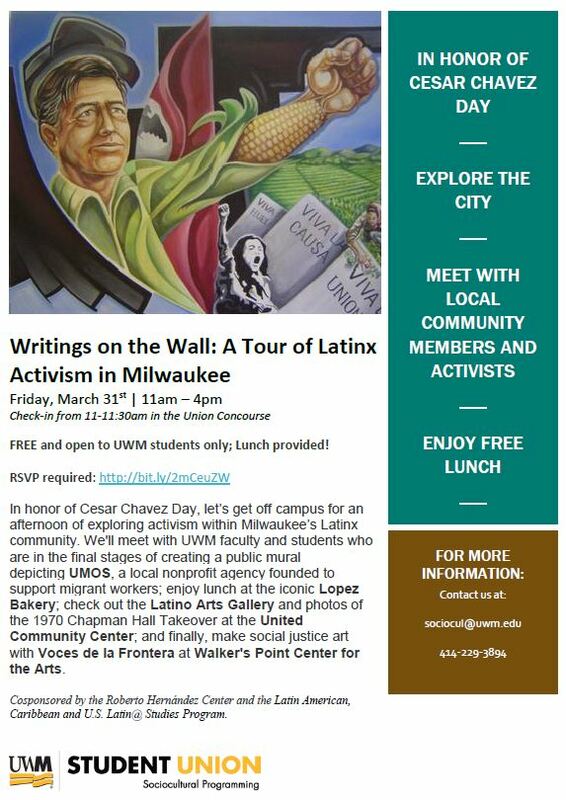 We’ll meet with UWM faculty and students who are in the final stages of creating a public mural depicting UMOS, a local nonprofit agency founded to support migrant workers; enjoy lunch at the iconic Lopez Bakery; check out the Latino Arts Gallery and photos of the 1970 Chapman Hall Takeover at the United Community Center; and finally, make social justice art with Voces de la Frontera at Walker’s Point Center for the Arts. Cosponsored by Sociocultural Programming, the Roberto Hernández Center and the Latin American, Caribbean and U.S. Latin@ Studies Program.